Final preparations at Kennedy Space Center (KSC) are in full swing as the NASA and United Space Alliance (USA) team gets ready to send Space Shuttle orbiter Endeavour from Florida to her retirement home at the California Science Center in Los Angeles, California. Endeavour made her final rollover in the early hours of Friday, greeting the Shuttle Carrier Aircraft (SCA) that she was mated with over the weekend. NASA 905, the remaining operational Boeing 747 SCA, returned to the Shuttle Landing Facility (SLF) on September 11 as work ramps up for the final cross-country ferry flight, which has been delayed to Tuesday, due to poor weather forecasts. The SCA touched down on Runway 15 at the SLF late Tuesday afternoon after leaving Dryden Flight Research Center at Edwards Air Force Base Flight in California earlier in the day. 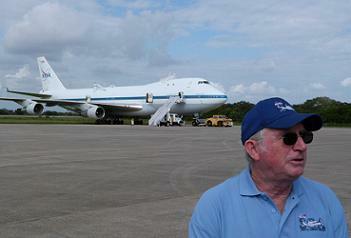 As in April when they delivered orbiter Discovery to her Washington, D.C. retirement home, the 747 flight crew taxied the jumbo jet to the south end of the landing field where the Mate Demate Device (MDD) is located and parked for final preparations to get it ready for Endeavour to be mated to the aircraft over the weekend. The area around NASA 905 wasn’t quite as busy as in April, since the aircraft remained largely in its orbiter ferry configuration; there’s still a few things left to do, though. “We’ve got some work to do besides…refueling,” Stephanie Stilson, NASA Flow Director for Orbiter Transition and Retirement, said during a question and answer session with the media in August. Meanwhile, Endeavour was waiting in High Bay 4 of the Vehicle Assembly Building (VAB) for her call to get ready to say goodbye to KSC. 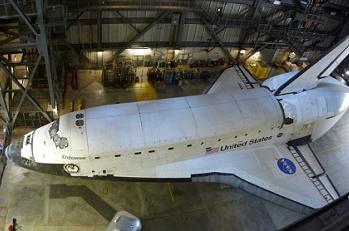 The retired spaceship had been on display in the VAB since vehicle processing was completed in mid-August. 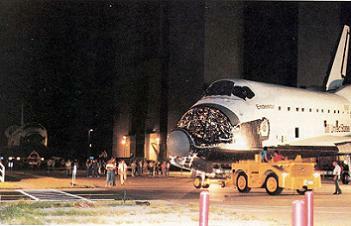 The final stay in the VAB is one element providing a symbolic bookend to Endeavour’s original homecoming to KSC in May, 1991. Now, as Endeavour is transported to her place of retirement, the plan is for the spaceship to retrace many of the steps of that original trip, with the mated Shuttle-747 combo stopping in most of the same places as that original, “delivery ferry” twenty-one years ago. 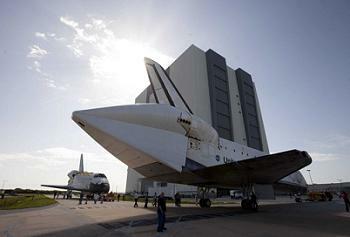 Before that happens though, Endeavour is retracing her original moves after first arrival at KSC. 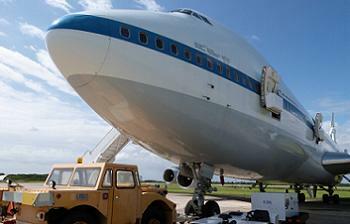 Endeavour was originally delivered to KSC on the back of the other Shuttle Carrier Aircraft, NASA 911. Recently retired, NASA 911 entered Shuttle ferry service with Endeavour’s flight from the Rockwell International final assembly plant in Palmdale, California. The duo arrived at the Shuttle Landing Facility on May 7, 1991, landing on Runway 15 less than 24 hours after Orbiter Discovery landed on the same runway to complete the STS-39 mission. Endeavour’s arrival brought the brought the Shuttle fleet back to four orbiters, but there were no vacancies in the OPF. 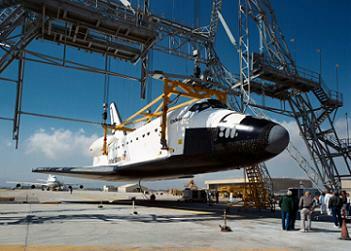 Discovery was being deserviced in OPF-1 to be turned around for STS-48. 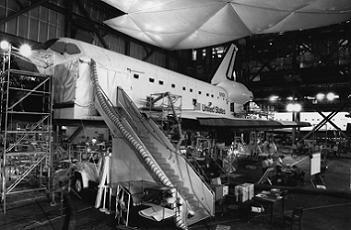 Meanwhile, Atlantis was getting ready for STS-43 in OPF-2, and OPF-3 was still a few months away from completing its transformation from the Orbiter Maintenance and Refurbishment Facility to a full OPF bay with repurposed equipment from the freshly abandoned Shuttle facilities at Vandenberg Air Force Base. Meanwhile, Columbia was stacked out on Launch Pad 39B in the middle pad processing for the STS-40 mission. This was a typical occurrence during this period of the Shuttle program, and Endeavour was first towed from the MDD to the VAB Transfer Aisle early on the morning of May 8, 1991, and then rolled around to VAB High Bay 2 on May 10. There she stayed for over two months while ferry flight hardware was removed, receiving inspections were performed, and some initial processing work was done. With her first flight still several months away and the other three vehicles flying a busy flight manifest, Endeavour didn’t get the next shot at an OPF vacancy. When Atlantis rolled over to the VAB for STS-43 on June 19th, OPF-2 stayed vacant for a few days until Columbia was ferried back to KSC from Edwards Air Force Base after STS-40. It wasn’t until Discovery’s STS-48 OPF flow was complete that Endeavour was first transferred to the OPF. Stacking and closeouts of the External Tank and Solid Rocket Boosters for STS-48 weren’t yet complete, so somewhat unusually, Discovery was backed out of OPF-1 on the Orbiter Transporter System (OTS) like a typical rollover; however, instead of immediately rolling into the Transfer Aisle for stacking, Discovery and Endeavour traded places, with Discovery parking in VAB High Bay 2 on the OTS for a week until her boosters and tank were ready for orbiter mate. Unlike recent swaps, the moves were made very late on July 25, 1991, with Endeavour rolling past Discovery and on into OPF Bay 1 at 11:40 pm, and then Discovery rolling into VAB High Bay 2 at 11:55 pm. Just as Discovery was on hand to welcome Endeavour to the OPF twenty-one years ago, another one of her sisterships marked OV-105’s OPF farewell on August 16; Atlantis was parked in about the same spot on the tow-way in between OPF-3 and the VAB when Endeavour rolled by to be parked for most of her final month at KSC, as she was backed out of VAB High Bay 4 and towed to the SLF. There, she will be precisely lined up in the MDD and attached to the device’s lifting sling. Then Endeavour will be lifted up between the 40-foot and 60-foot levels of the MDD and the SCA will be towed in for the two to be mated. The mated duo will be pushed back out of the MDD on Sunday to get ready for departure from Kennedy near sunrise on Tuesday, September 18. The two craft will both be wrapping up their flying careers together; after the SCA drops off Endeavour at LAX, it will make the short return trip back to Edwards Air Force Base, which will be the 747’s last flight. “I’m not sure when it’s going to hit me the hardest: when we get to L.A. or when we take it back to Edwards and park it and say ‘that’s it, thirty-something years of flying and it’s done’,” Henry Taylor, SCA crew flight engineer said. However, first will be the three day tour, opening with the flight making a couple of loops around the Cape Canaveral area to say goodbye, the flight crew will take Endeavour and the SCA around the Gulf Coast to Ellington Field near the Johnson Space Center in Texas. After spending two nights at Ellington, the ferry will refuel at Biggs Army Air Field in El Paso, before heading to Edwards Air Force Base in California. The planned flight path retraces in reverse much of that Eastbound delivery ferry in 1991, when Endeavour and NASA 911 stopped at Biggs and Ellington (with a stop in San Antonio in between) before reaching Kennedy. This time, Endeavour and NASA 905 will stop at nearby Edwards on September 20 rather than Palmdale and they’ll still have one more stop to go: flying from Edwards to Los Angeles International Airport (LAX) on September 21.